The three main types of human dining tools are fingers, forks and chopsticks. Seizing food with the fingers is a custom mainly practiced in Africa, the Middle East, Indonesia and the Indian subcontinent. The Europeans and North Americans use forks for dining. Other people, like the Chinese, Japanese, Vietnamese, and Koreans, have used chopsticks as part of their traditional eating utensils for thousands of years. Traditionally and historically, Hawaiians also used their fingers to eat their meals. Eventually Western and Eastern traditions began to influence the eating habits of the Hawaiians with the use of knives and forks and chopsticks. 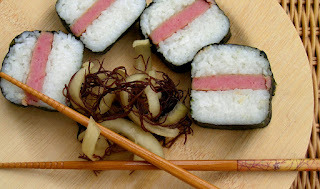 Today you'll come across chopsticks at almost any Hawaii eatery, particularly ones serving local or Asian dishes; most times they offer chopsticks as an alternative to using a fork. Chopsticks were developed about 3,000 years ago in China. The first chopsticks were probably used for cooking, stirring the fire, serving or seizing bits of food, and not as eating utensils. Chopsticks began to be used as eating utensils during the Han Dynasty. It was not until the Ming Dynasty that chopsticks came into normal use for both serving and eating. They then acquired the name "kuaizi" and the present shape of the chopstick. In Japan, chopsticks were originally considered precious and were used exclusively for religious ceremonies. The earliest chopsticks used for eating looked like tweezers; they were made from one piece of bamboo that was joined at the top. By the 10th Century, chopsticks were being produced in two separate pieces. Japanese chopsticks differed in design from Chinese chopsticks in that they were rounded and came to a point; they were also shorter (7 inches long for females and 8 inches long for males). Traditionally, chopsticks have been made from a variety of materials. Bamboo has been the most popular because it is inexpensive, readily available, easy to split, resistant to heat, and has no perceptible odor or taste. Cedar, sandalwood, teak, pine, and bone have also been used. The wealthy, however, often had chopsticks made from jade, gold, bronze, brass, agate, coral, ivory, and silver. The Japanese were the first to lacquer wooden chopsticks, making them slippery but usable. The Japanese were also the first to create disposable wooden chopsticks (called "wari-bashi"), which appeared in 1878. Disposable chopsticks are typically made from fast growing woods like birch, poplar and bamboo that are not endangered. Today they're so common that Japan uses about 24 billion pairs a year, and in China, factories are turning out roughly 63 billion pairs of disposable chopsticks each year. That's a lot of sticks! I think we've all had trouble using chopsticks, especially in the beginning. Trying to pick up small pieces of food with a pair of sticks isn't as easy as using your hands or a fork. The idea is to use the same hand you use when holding a fork or spoon and think of it like this: top stick moves, bottom stick is stationary. Operate the top stick with your pointer and middle finger, while resting the bottom chopstick between the base of your thumb and index finger. After a while you will get the hang of it, and it becomes a fun way to eat. • Don't shovel food directly from your rice bowl into your mouth. • Don't take food from a communal plate with you own chopsticks, this is considered unsanitary. You should use the supplied serving utensils. • Never leave chopsticks standing vertically in a bowl of rice or food; this gesture is used to honor deceased family members. When not using your chopsticks, place them on the chopstick holder. • Don't stab food with the chopsticks like a spear. The chopsticks never go through the food but only around it. • Don't let liquids drip from your chopsticks. • Don't stir your food around with your chopsticks. This is considered to be rather insulting to the cook. • Don't use chopsticks to dig around your meal for a particular morsel; it symbolizes digging your grave. • Don't point chopsticks at others seated at the table, whether at rest or in your hand. • Don't leave chopsticks crossed at the table; it symbolizes death. • Do not lick or touch your lips with the chopsticks while eating, because most of the time you will be eating a "family style" meal. This means that everyone will be eating from the same bowl. • Do not make noise with the chopsticks. Playing with chopsticks is considered bad manners and it decreases your status during a party or banquet. • When you see that your chopsticks are not the same length, don't eat with them. Instead, you should ask the waiter/waitress to exchange them for you. • There are some who say that if you drop your chopsticks while eating, then it will bring you bad luck. And there are some others that say that if you do so, you will be poor. Either way, there is nothing good that will come out of it. However, this is a very old tradition and not many people pay attention to it. Don't worry if you drop your chopsticks. In our modern times, all you need to do is ask for a replacement. • To signal that you are finished with your meal, you put the chopsticks across your bowl. As far as I am concerned, it doesn't matter whether you are using fingers, forks or chopsticks, as long as you get those tasty morsels in your mouth. TOTAL NUMBER OF PAGE VIEWS FROM AROUND THE WORLD... THANK YOU! It's So Good... It's Addictive! FOLLOW TASTING HAWAII BY EMAIL! New posts will be sent to you as soon as they are published. "MANINI", The Small Fish That Tastes So Good! All text and images on this site are protected by copyright and may not be reproduced in any way or form without the expressed written consent of James Temple. If you have any questions about this site, or about this sites content, please send an email to tastinghawaii@gmail.com. All text and photos © 2011-2019 tastinghawaii.com, a Tasting Hawaii, LLC website. First of all, thanks for visiting Tasting Hawaii, my way of introducing you to the multi-ethnic cuisine found on these tropical Hawaiian islands. 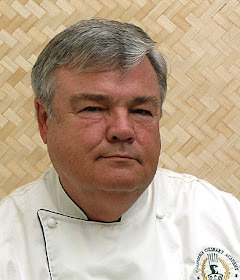 I'm a retired chef living on the Hawaiian island of Moloka'i. It is small and rural, with a population of only 7,345. This island is tucked away between Oahu and Maui. It's special because the people living here are mostly Hawaiian. They love the old ways of aloha, where family comes first, helping your neighbor is important, and growth and tourism is not in their vocabulary. In ancient times, it was the task of the men to prepare the food, and men and women ate meals separately. Hawaiians have always loved to cook, and so do I. No matter where you live, we all have one thing in common... FOOD. To me, sharing lives over a meal makes food what it was always meant to be, not just a nourisher, but a uniter of hearts. After 35 years in the advertising business I thought... it's time to expand my horizons. I decided to make a big change and go back to school... cooking school. In January, 2003 I graduated from the California Culinary Academy in San Francisco, California, with an Associate of Occupational Studies in Le Cordon Bleu, Culinary Arts Degree. I love living and cooking, especially in Hawaii. I hope you find a recipe on this blog that will become a family favorite, and that you will learn a little about Tasting Hawaii and cooking with Aloha. 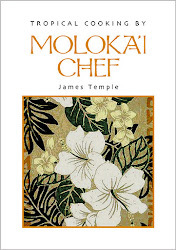 CHEF JAMES TEMPLE'S COOKBOOKS: "COOKING ON MOLOKA'I"
Cooking in Hawaii is like a painter's pallet, a fusion of flavors from many nationalities, a tropical melting pot that is unique to the culinary world. This 170 page cookbook has over 120 local recipes like: Fried Honey Sesame Shrimp, Chicken Adobo in Coconut Milk, Spicy Thai Beef Salad. and Tahitian Lime Pie. These recipes are some of the best 'grindz' enjoyed on Moloka'i and the Hawaiian islands. Did you know that there are over 45,000 tropical islands around the world. 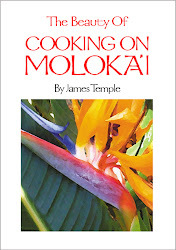 This 170 page cookbook has a collection of over 120 tropical island recipes. Recipes like: "Banana Crumble Muffins", "Aruban Citrus Chicken", "Pineapple Rum Cake", "Lime-Garlic Pork Roast", "Black Bean, Heart of Palm, and Corn Salad", "Coconut Crab Cakes with Avocado Mango Salsa", "Coconut Shrimp Hush-puppies", or "Tropical Island Gazpacho", just to name a few. In Greek mythology, Ambrosia was the food of the Gods, an elixir of life. 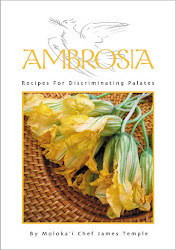 Today, Ambrosia is still a word that stands for the best of food, food that is good enough to be eaten by the Greek Gods. This 170 page cookbook has over 120 recipes like: "Roasted Beet Bruschetta", "Cream of Artichoke Soup", Celery Root Salad with Capers and Lemon", "Roast Pork with Dried Fruit", "Shirred Eggs with Lobster", and "Plum Crumble". This is a culinary oasis that will bring fine dining to your world and romance to your plate, whether you are a deity or not. • My wife Kimberly's Saturday Farmer's Market booth located next to Bank of Hawaii in Kaunakakai. 8:30 am until noon, most Saturdays – $20 each, cash only! Creations by Kimberly is my wife's company. She specializes in wholesale custom pillow cases, placemats, aprons, tote bags, etc., all in beautiful tropical fabrics. 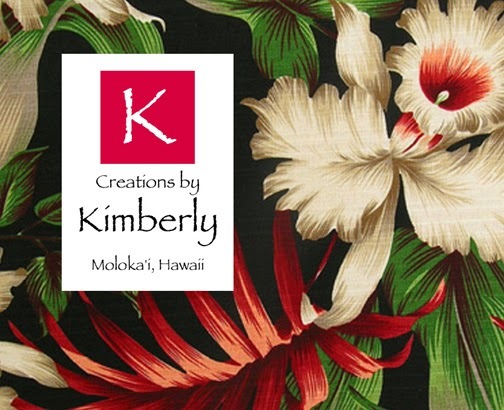 Kimberly's products are sold in retail outlets on most of Hawaii's islands. Click on the logo above to visit her website and see her products.